Getting an Elephant to swallow a large metal pill is no easy task, they are very intelligent animals and will check the food you prepare for them. Even hiding a 3 centimetre long capsule in bananas an Elephants favourite food doesn’t work. If they bite on them they will spit them back out. Instead it was discovered to wait until their mouths are open then throw the pills down their throats along with some tasty treats. The metal pills that are harmless contain not medicine but temperature sensors and radio transmitters. For big animals, staying cool is a challenge and yet Elephants, the largest land mammals in the world, live in some of the worlds hottest countries. So how do they survive the heat? Well this is where environmental research comes into practice from which it was decided to find out just how Elephants’ keep cool. It was discovered Elephants have evolved some surprisingly sophisticated tricks. Large warm blooded animals not only generate a lot of internal heat, they have a smaller surface area to their volume. To maintain their body temperature when it’s hot, then an Elephant has to lose far more heat per unit of surface area than an average human. The bigger the Elephant the bigger the problem. What’s more Elephants “don’t sweat” they don’t pant either, probably because it doesn’t work well for such a vast sized mammal from which panting could cause them to hyperventilate to even collapse and die. So panting is just out of the question for these large mammals. Instead of course Elephants have their huge ears, which act as radiators. They’re pretty effective; A 1992 study calculated that at a temperature of 20oc, a 2000 KG African Elephant could shed all it’s excess heat through it’s ears alone. But an African Elephant’s can weigh up to 7000kgs and have to survive temperatures that can soar above 40oc. The ears of the Asian Elephant’s meanwhile, are just a third of the size of the African Elephants, so they can only lose a third as much heat through them. Clearly ears are not enough. We’ve known about some of their other strategies for a while. One is to flap their ears, to increase heat loss. Another is to travel to the nearest pool. Not only does water provide immediate cooling, but the Elephants wrinkled skin traps a lot of moisture and mud, providing a lasting cooling effect as it slowly evaporates. 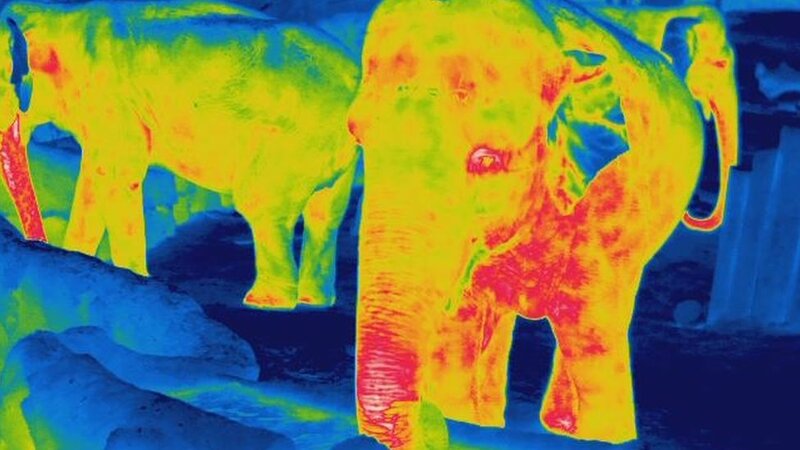 Thermal images of six African Elephants at Vienna Zoological Gardens where taken, it was then discovered Elephants had another trick. It was first expected to see the ears show up as hot patches as the Elephants shed heat however other hot patches emerged on the animals bodies, including on the legs and on their flanks. Only Elephants ears where thought to have this dense network of blood vessels required to heat up the skin to this extent. But it now appears many other areas are just as well equipped (Journal of Thermal Biology vol;35 p 182). What’s more Elephants seem to have an astonishing degree of thermal control. As it got warmer, it was expected to see the whole of each ear to heat up. Instead only small patches warmed at first, the temperature difference between the hot and cold patches was vast – as high as 20oc as the temperature rose higher still the hot areas expanded and eventually merged. All mammals have skin patches that can act as thermal windows through which heat can escape. But Elephants are the [first] animals known to open, close and merge their windows in this way. It is thought this ability allows the Elephants to fine tune their body temperature in moderate weather, these thermal windows are only used when the Elephant is comfortable, they are not freezing and don’t feel to hot. However other researchers have stated that Elephants can even cool specific organs depending on which skin patches heat up. Heat flow through these patches is increased in another, unexpected way; by hair. While Elephants [appear] to be bald, they are in fact covered in sparse hairs. They’re bristly, and wiry, and very thick. Thick hair keeps mammals warm by trapping a layer of insulating air next to the skin thus reducing heat loss. But Elephant hair is to sparse for that, instead it was wondered if the hairs could act as tiny heat fins. Investigations then began to delve deeper into this mystery, researchers began investigating this effect by tweaking a computer model normally used to calculate the effectiveness of heat exchangers used for cooling electrical component‘s. The altered model suggests that Elephants hairs can boost heat loss from the skin by up to 20% (Plos One, Vol 7 Pe47018). Many fascinating things are being found out about these great mammals of which one researcher suggested that hair is not just a relic of their past, but may have evolved to help keep Elephants cool. In fact perhaps hair originally evolved for cooling rather than warming (although this is still a speculation). However this host of tricks for shedding heat is not enough in extreme conditions. Then, Elephants’ resort to a radical strategy. This is where the pill like temperature sensors come in. Teams managed to get seventeen Asian Elephants from Zoological Gardens in Germany and Thailand to swallow the capsules. it’s the only way to monitor the Elephants core temperature. You cannot use rectal measures inside the Elephant to obtain the core body temperature. In Germany where the ambient temperature was around 21oc the Elephants core temperature varied by around half a degree over the course of the day. But in the Thailand, where the temperature was around 30oc they varied by more than 1 degree from a minimum of 35.5oc at night, the Elephants core temperature rose as high as 38oc during the day (Journal of Comparative Physiology B, vol 182; p 311). So the Elephants in Thailand are turning size to their advantage. Large bodies are not are not only hard to cool, they also take time to warm up. By letting their body temperature drop abnormally low during the night, the Elephants can endure higher temperatures during the day without getting dangerously hot. A few other animals do this too – a camels temperature can range from 34oc to over 41oc – but the strategy was thought to be the preserve of desert mammals. It is thought that African Elephants must adopt this trick to stay cool, but no one has monitored core temperatures in African Elephants exposed to extreme heat. Other large mammals, such as Rhinoceros and Giraffes may well all do the same. What is clear is that as the planet warms, staying cool is going to become even a bigger challenge for larger animals. With night time temperatures rising even faster than daytime ones in many regions, even the strategy of chilling down at a night to survive hot days might not be enough. Some parts of Elephants current ranges cold become too hot for them to survive. Its pretty obvious that Elephants are going to change their behaviour. They may change physically too. Perhaps Elephants will be forced to resort to the most radical strategy of all for a large animal – and that is regrettably – shrinking.